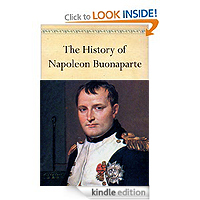 The History of Napoleon Buonaparte by John Gibson Lockhart. The definitive biography of Napoleon, finely written in an engaging and authoritative style. The "use of English" will, I am sure, be regarded by some as old fashioned, however, if you wish to read the highest quality writing, this will not disappoint, Subsequent biographies have drawn heavily on the Lockhart edition, and even where they include sources unavailable to that author, they fail to match the energy and vigour with which Lockhart carries through the story of Napoleon's rise to greatness and his eventual fall.